Aluminum Wall Art "Moon Man"
This futuristic wall art is made of aluminum and measures 30''x30''. 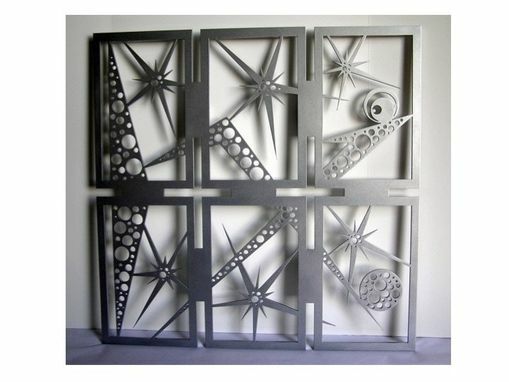 It is an abstract piece that depicts a man on the moon. An alien silver powder coating was used on the aluminum to make it shimmer. Mounting posts are attached on the back of the piece, which makes it appear as if the piece is floating when hung on the wall. The 1 1/2'' distance of the artwork from the wall casts beautiful shadows.